International Podcast Day is celebrated across the world on September 30. The holiday is dedicated to one of the most popular media formats on the Web that has been developing rapidly over the past few years. A podcast is an episodic series of digital audio (or sometimes video) files that a user can download in order to listen to. Many podcasts are available for subscription, so that new episodes are automatically downloaded via web syndication to the user’s device. The term “podcast” was coined by British journalist and internet technologist Ben Hammersley as a portmanteau of “iPod” (a brand of portable media players developed by Apple) and “broadcast”. Podcasts have become extremely popular online for a number of reasons. You can listen to them anytime, anywhere, as long as you’ve downloaded a new episode to your portable media player, smartphone, or other device. They are usually free of charge to listeners, which also contributes to their popularity. International Podcast Day was conceived by Steve Lee, the founder of Modern Life Network. Having heard a radio announcement for National Senior Citizens’ Day, he thought it would be cool to create a day that celebrates podcasting. 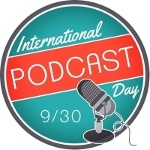 The inaugural International Podcast Day was celebrated on September 30, 2014 with more than 6 hours of live streaming. The main goal of International Podcast Day is to promote podcasting all over the world and to give people an opportunity to connect with fellow podcasters, podcast listeners and enthusiasts, and industry leaders.